We’ve just helped a client develop two new ‘hair drinks’ that they launched at the IFE show in London. 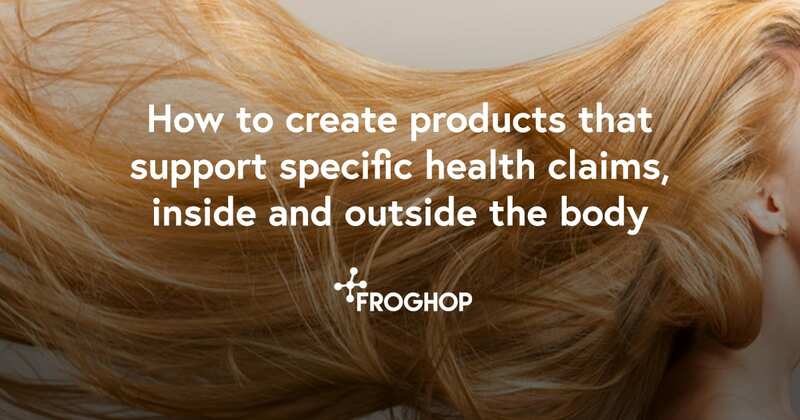 The drinks’ claims are based on ingredients that are proven to recharge the hair. Let’s take a closer look at the process of developing products with specific, and sometimes, less obvious claims. If you want to create a product with a specific claim you need to look at the established benefits of relevant nutrients. When we think about nutrients, we tend to focus on gut health, low-fat, low-sugar, energy levels, growth and so on. Yet, nutrients can also have a more external impact such as those that support healthy skin or hair – which is what we did in this case. Pivotal has launched a new NutriCosmetic brand that targets hair and skin health with functional naturally flavoured waters. The products are: RE-NU-ME Hair and RE-NU-ME Skin NutriWater and are made with a range of balanced ingredients from around the world. Containing plant proteins and essential amino acids required to support the production of keratin (hair) or collagen (skin), anti-oxidant astaxanthin, and fortified with a perfect blend of vitamins, minerals, electrolytes and AnaGain™ (hair) or Dracobelle™ (skin). The nutrients in the hair NutriWater are scientifically proven to reduce hair loss and increase hair density after 60 days’ use. While the ingredients in the skin NutriWater are scientifically proven to reduce the signs of ageing by mimicking the effect of caloric restriction and exercise. AnaGain™ was developed using a bioassay-guided approach based on DNA microarray technology. It stimulates specific signalling molecules in the Dermal Papilla cells which are required to initiate the growth of new hair: Noggin, a protein that shortens the hair telogen phase. FGF7, fibroblast growth factor-7, which promotes the proliferation of the matrix keratinocytes at the beginning of a new Anagen phase. DracoBelle™ Nu is a natural anti-ageing ingredient that is prepared from the organic aerial parts of cultivated Moldavian Dragonhead. It mimics the beneficial effects of caloric restriction and exercise and activates the anti-ageing AMPK / FOXO pathway. It has been clinically demonstrated in the improvement of skin moisture, elasticity and density within 60 days. Firstly, establish the requirements of the claims you wish to make. Check out the EFSA guidance on established claims. One of the key objectives of the regulation of the use of nutrition and health claims for foods is to ensure that any claim made on a food label in the EU is clear and substantiated by scientific evidence. Often our research leads us to other ingredients that deliver additional benefits but it’s important to keep focused on one USP for the product to make it more targeted and clearer to market. Develop a recipe and agree the core requirements that deliver the specific ingredients and claims. We help to define the product, its ingredients and the processing to be used as well as defining what it will deliver. We can tell you the shelf-life that it’s likely to achieve and confirm whether we recommend chilled, ambient, fresh or frozen distribution. We will also have done some patent and claim searches. Create a prototype that delivers on taste, sensory, appearance, shelf-life and so on. We help clients to develop a robust food prototype and samples while factoring in practicalities such as sourcing, stability, shelf-life and compliance. It can be costly to get too far along the process without making sure the essential requirements are met. Our clients find prototyping a product is indispensable. Contact us to discuss how we can help you stand-out with effective claims in an innovative product.